for example surgical procedures, CPAP or Mandibular Advancement. 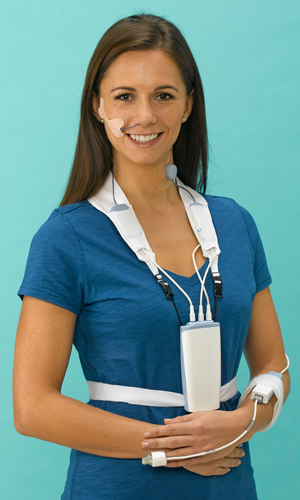 The ApneaGraph Spiro is also the only ambulatory system which deploys the recommended ‘gold standard’ Oesophageal Pressure, for determination of both Respiratory Effort (RE) and increased RE leading to arousals. NEW – Respiratory effort frequency (REF) based on the oesophageal pressure recording over whole night. In addition to usual assessment of Normo-, Tachy- and Bradypnoe this new algorithm increases the ability to differentiate easily between obstructive and central apneas and provides useful information in the assessment of Cheyne-Stoke Respiration. (CSR). Guidance to all treatment modalities, including pre-operative evaluation of site of obstruction to help improve patient treatment outcomes. Snoring – Two microphones at the neck (one contact microphone, one airborne microphone). 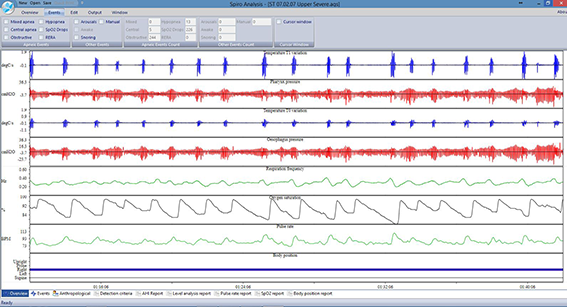 accelerometer differentiating “upright”, supine”, “prone”, “left” and “right” position. The new ApneaGraph Spiro analysis software offers improvements in terms of the reporting capability and additional new diagnostic features. derived displays to ease difficult analysis decisions. We would be delighted to discuss your interest in the new ApneaGraph Spiro in more detail, please contact us directly on (+44) 01451 812402 or via email info@gds-medtech.com and we will be happy to assist you.